Christian mother Asia Bibi’s legal situation remains in limbo following her acquittal on charges of blasphemy. Bibi, 53, had her death sentence overturned by the Supreme Court in a landmark ruling made on October 31. Since then, she has faced a painful predicament: be released into the public and face almost certain death at the hands of Islamist radicals, or stay effectively imprisoned, under armed guard at an undisclosed location in Islamabad. With her lawyer having fled to the Netherlands, Bibi and her family have been appealing for asylum in various western nations. As yet, however, no offer has been made official. To add to her woes, Prime Minister Imran Khan’s government is making it difficult for her to travel abroad after striking a deal with radical Islamist clerics in a bid to calm the increasingly violent protests at Bibi’s ruling. And, while her own government seeks to put her on its Exit Control List (ECL), a petition has been lodged by those same religious fundamentalists in a bid to identify “errors” in the Supreme Court ruling – an appeal that the government has agreed not to obstruct. Should the review conclude that the Supreme Court was erroneous in its ruling, Bibi could find herself thrown back into prison, and may be swiftly placed on death row once again. Right now, then, the absolute priority for Bibi and her family is to be granted asylum in a country which will protect them. There have been numerous rumors swirling that Bibi is soon to be smuggled out of the country and into the safe haven of Canada, Italy or even the United Kingdom. Others have suggested that she has already left. But this has been repeatedly denied by government officials. “We have clarified earlier and we clarify it again. She has not gone abroad,” said Pakistani Foreign Minister Shah Mehmood Qureshi Wednesday, according to the Times of India. The government has said that Bibi will not be allowed to leave Pakistan until a final review is made. The review, the government says, will seek to determine whether any “clerical errors” were made during the judicial process that plunged much of Pakistan into mayhem. Experts believe that it is highly unlikely the Supreme Court, the highest legal body in the land, will be overruled in this explosively controversial case. The radical Islamist Tehreek-e-Labaik Pakistan (TLP) party is the group leading the campaign against Bibi, and is demanding that the Supreme Court decision be reversed. “We strongly oppose even her release. And this is a view of millions of Pakistani Muslims,” said TLP spokesman Ijaz Ashrafi following the ruing. While many continue to rile up crowds and demand Bibi’s execution, other Pakistani religious leaders have urged that the results of this final review should be accepted. “The verdict of the bench considering the review petition would be final and has to be respected wholeheartedly,” said prominent religious scholar Mufti Ragi Usmani. Despite a personal plea to the UK, and pressure from numerous leading politicians, the British Government is still yet to offer asylum to the stricken woman and her family. Even the head of government agency the “Commission for Countering Extremism,” Sara Khan, noted that granting the 53-year-old asylum would be the “right thing to do.” But still, there is no word from the British government on Bibi’s request. “This is an opportunity to send a clear message to extremists that our country will stand up for our values,” Khan told the BBC. But Mcdonald insisted that arranging Bibi’s safe escape and settlement in another willing country would be the best way to go. “If the objective is to protect life and some other country can provide some more complete safe harbor, why should the UK not be open to working with that country?” he said. 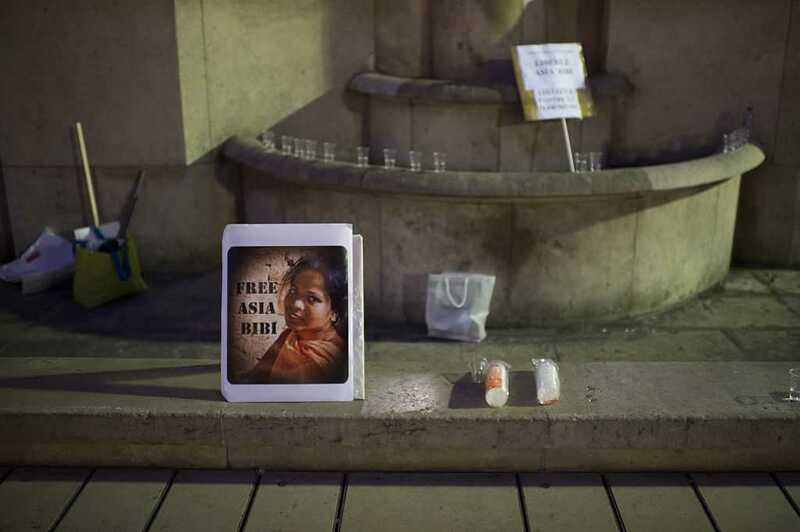 Several other British and European politicians have criticized this strategy as the UK government “washing its hands” of Bibi, despite her grave predicament.“It is immoral that Britain will allow thousands of illegal economic migrants to come into our country pretending to be refugees in need of asylum, and then bar Asia, a young woman in danger of the most terrible mob death because she is a believing Christian,” unaffiliated MEP, Steven Wolf, told Faithwire. Many politicians from across the aisle agreed. Pakistani Prime Minister Imran Khan initially appeared stoic and strong, firmly appealing for calm following the explosive protests that erupted among the Islamist fanatics who were enraged by the courts sweeping away of the decade-old blasphemy charges leveled against Bibi. Then, he caved, offering the radical, terror-affiliated political group Tehreek-e-Labbaik Pakistan (TLP) a deal – the Supreme Court ruling would have to remain, but Bibi would not be able to flee the country. It was, in effect, a second signing of Asia’s death warrant. In a country where politicians have been shot dead in broad daylight for speaking out publicly against the nation’s draconian blasphemy laws, Bibi would now become a sitting duck and an almost certain victim of Pakistan’s culture of savage vigilantism. Released last week from her squalid prison in Punjab province, Bibi was transported to an undisclosed location in Islamabad as various governments continue to figure out a way of getting her away from the thousands-strong, blood-thirsty Islamists. The ability to fly abroad remains a key factor in this horrifying case, as Bibi attempts to seek asylum in the West. So far, Bibi’s husband Ashiq Masih has appealed for help from several nations including the UK, US, Canada, with no success. The government has issued mixed messages about Bibi’s ability to travel abroad, initially saying that it had struck a deal with radical clerics and ordered that the embattled woman is put on a no-fly list. More recently, however, a spokesman for the Pakistani Foreign Office suggested that Bibi was free to leave. Bibi’s husband Sadiq Masih has said the family is in grave danger and has made several pleas for asylum in the UK, US and Canada. So far, there have been no official offers of asylum from any of those three nations. Do continue to pray for Asia Bibi and her family as they fight for justice.